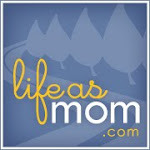 Today at Life As Mom, the recipe theme is Grilled Foods! So, today I thought I'd share a recipe for tri-tip! In case you're not familiar with tri-tip, it is "a cut of beef from the bottom sirloin primal cut". It is a small triangular muscle, usually 1.5 - 2.5 pounds per side of beef. (Thanks wikipedia!) Because there is only one tri-tip per side of beef, this cut was typically turned into ground beef until the folks in Santa Maria, California started rubbing it with salt, pepper and other seasonings and grilling it. Thank you Santa Marians for saving this superb cut from an destiny of ground beef! Oh my, is it good! In our area, tri-tip costs about $5/pound untrimmed normally but goes on sale frequently for about $2.50/pound (untrimmed). Even at regular price, it can still be a decently priced meal for a crowd. It's at least a lot cheaper than going out, and makes for a quick and easy meal. Around our house, it is a go-to meal when we're entertaining friends and family. When we have it, my hubby grills it up and then I make some rice pilaf, veggies and a caesar salad. Thankfully there is very little clean-up afterwards so we can enjoy visiting with our guests! If we don't have guests, we usually have enough left over to reheat for tri-tip burritos. We just slice the tri-tip into strips and wrap in a tortilla along with Mexican rice, cheese, salsa and sour cream. Yum! Today I'm including our family's basic method of grilling tri-tip as well as a dry rub that you can use to season the beef. I got the rub recipe from my Mothers of Preschoolers group. I don't know how "authentic" the rub is as far as Santa Maria style goes, but we enjoyed it. We only used two scoops for one tri-tip, but next time we'll use more! I don't know that it is possible to overseason a tri-tip. 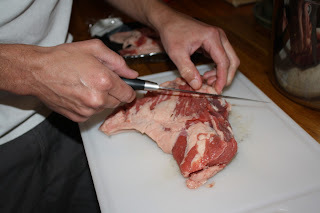 Trim the white fat and any gristle off of the tri-tip. This is important - if there is too much fat left on it, it will flare up and burn the tri-tip. You don't want that...so trim it well. 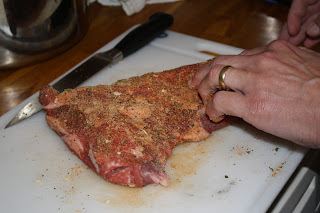 Sprinkle the entire tri-tip generously with granulated garlic (or garlic powder) and seasoned salt. Grill until desired doneness. We like ours medium-rare. Mix ingredients together. 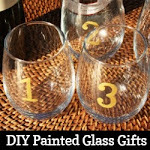 If storing, put in an airtight jar. Sprinkle trimmed tri-tip liberally with mix and rub into the meat. If you wish, you can allow it to marinate in the fridge or grill it right away.